Unaware of problems associated with behaviour. Certain that the positives of the behaviour out- weigh the negative. Not interested in change. Unwilling to change. No intention to change. Becomes aware of problems associated with behaviour. Ambivalent regarding positives and negatives. Explores the potential to change. Desires to change behaviour but lacks confidence and commitment. Intends to change before 6 months. This is an event, not a stage. Concludes that the negatives of the behaviour out-weigh the positives and chooses to change behavior. Accepts responsibility to change behaviour. Evaluates and selects techniques for behaviour. Develops a plan. Builds confidence and commitment. Intends to change within one month. 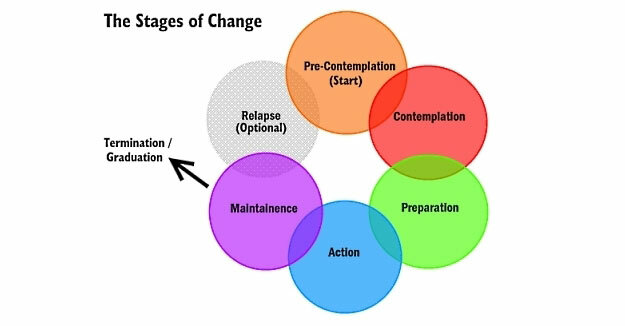 Engages in self-directed behaviour change effort. Gains new insights and develops new skills. Consciously chooses new behaviour. Learns to overcome the tendencies for unwanted behaviour. Active in action stage for less than six months. Masters the ability to sustain new behaviour with minimum effort. Establishes desired new behaviour patterns and self-control. Remains alert to high- risk situations. Focus is on lapse prevention. Has changed behaviour for six months. This is an event, not a stage. May occur at any time. Personal distress or social pressures are allowed to interrupt the behaviour change process. Temporary loss of progress which resumes at an earlier stage. Experience is educational to help prevent further recurrence. Adopts new self-image consistent with desired behaviour and lifestyle. Does not react to temptation in any situation. Expresses confidence and enjoys self-control. Appreciates healthier and happier life.